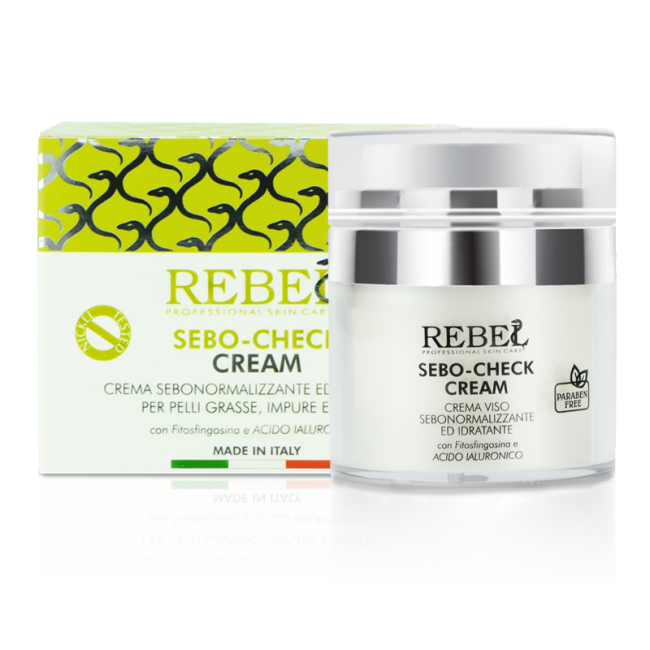 The first cream able to guarantee a perfect balance between sebum and moisturizing, specially studied for oily, impure and combination skin. 50 ml Airless Vase. Rebel Sebo-Check is the first cream specially formulated to normalize oily, unclean skin (with dilated pores) and combination skin (with seborrheic areas alternated with dry and arid areas). It truly checks the skin to identify oily and dry areas. 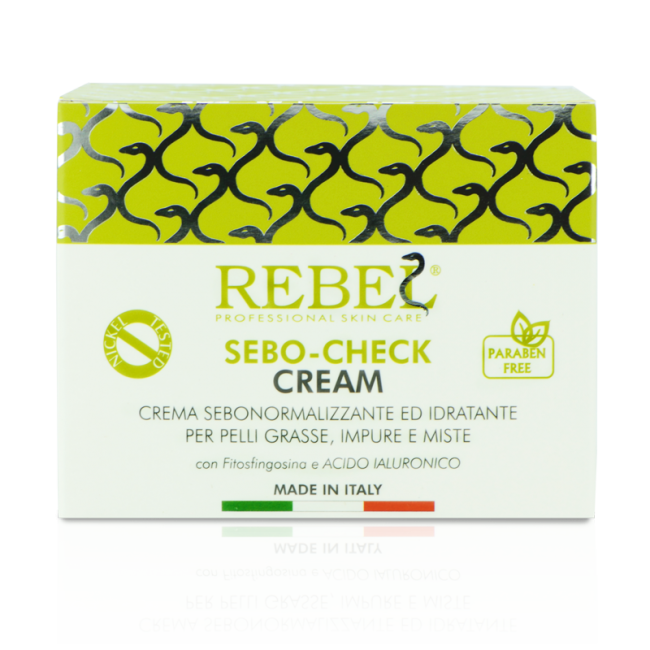 Its innovative formula doesn’t dry the skin and helps it find and maintain the right water-lipid balance by inhibiting sebum production in oily parts of the skin and stimulating it on its dry parts. 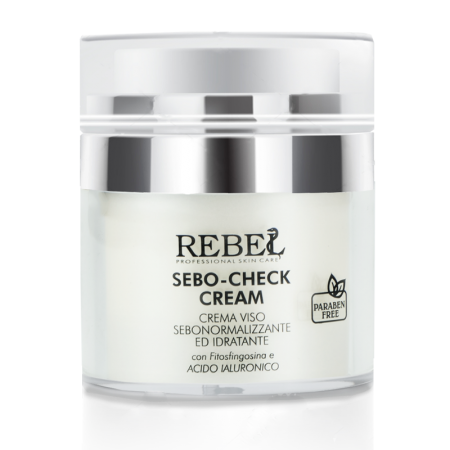 Rebel Sebo-Check Cream visibly reduces dilated pores and the shiny effect, giving a soft, homogeneous, smooth and firm skin. With Phytosphingosine, Glutamic Acid, Oleanolic and Diidroguaiaretic Acid, Methionine, Cystine, Vitamin B6 & H.
With Hyaluronic Acid, Sweet Almond Oil, Wheat Germ Oil and Vitamin A & E to hydrate, nourish, fight the free radical and regenerate the skin cells. Aqua, Ethylhexyl methoxycinnamate, Prunus amygdalus dulcis oil, Glycerin, Olea europaea oil unsaponifiables, Cetearyl alcohol, Cetyl alcohol, Butylene glycol, Olea europaea fruit oil, Oryza sativa bran oil, Glyceryl stearate, Potassium palmitoyl hydrolyzed wheat protein, Bis-ethylhexyloxyphenol methoxyphenyl triazine, Cyclotetrasiloxane, Xanthan gum, Oleanolic acid, Parfum, Cyclopentasiloxane, Hydrolyzed milk protein, Propylene glycol, PEG-60 almond glycerides, Butylene glycol behenate, Phytosphingosine, Enantia chlorantha bark extract, Sodium hyaluronate, Lycopene, Nordihydroguaiaretic acid, Tocopheryl acetate, Retinyl palmitate, Triticum vulgare seed extract, Caprylyl glycol, Carbomer, Benzyl PCA, Phenoxyethanol, BHT.